Made September 1993, during my residency at 27A Access Artspace, Leicester, when I shared my woodcarving skills with six people with varying disabilities. Achieved by woodcarving novices in four weeks, the relief panels were carved from lime and painted with watercolour. I contributed two panels myself. The pine door was made in the joinery workshop next door. 27A Access Artspace, in Belvoir Street, Leicester, provided disabled people of Leicester and the surrounding area with an arts workshop run and managed on disabled people's terms. I did encourage the six people I worked with, all woodcarving beginners, to design their pieces based on a collective theme promoting positive images of disability. 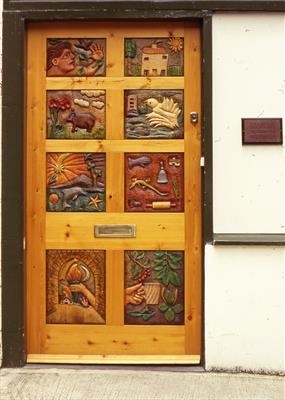 However, each person created very different, individual designs which nevertheless expressed a surprising unity when assembled into the new door.